Mind mapping is a quick and efficient way to start up a project. When you create a mind map, it might be necessary to use previously recorded files, notes, or text outlines. The importing capabilities of ConceptDraw MINDMAP allow you to easily convert text into a mind map. You can quickly turn your TXT file to the hierarchical structure of mind map. You can convert the entire TXT file as well as a selected part. ConceptDraw MINDMAP supports the ability to convert text in both single-page and multi-page mind map. Importing text data is easier than ever in ConceptDraw MINDMAP v8. If you are wondering how to import your ideas into a mind map, the following information will answer all your questions. The Blank Document page will be opened. Click the File menu, select Import and then choose Text Indented or Text Numerated item. The Open dialog appears. Select a TXT file and click Open. Your text outline will be converted to Mind Map structure. Add a new mind map page using the Page Navigator panel in the left-bottom corner of the window. Use a copy-and-paste. There is a lot of functionality in ConceptDraw MINDMAP copy-and-paste capability. 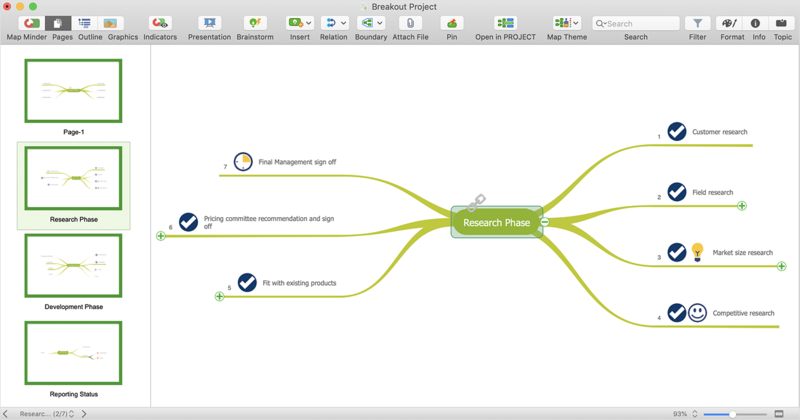 For example, you can select a single branch from your mind map and paste it into your project file, and so forth. Result: You can create a multiple page project mind map quickly, using various text workpieces. Two-way exchange of documents between ConceptDraw MINDMAP and MS Word®. Exchange data with MindManager®, XMind®, FreeMind®, Microsoft® Office®. Social networking via Twitter®, Facebook®.